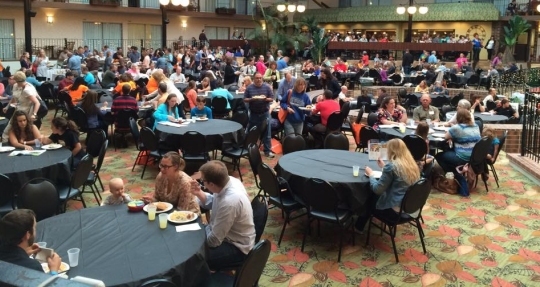 A portion of the crowd at the 2015 Homeschool Iowa Conference. I spent this past weekend speaking at the Homeschool Iowa Conference. I had never been to this particular homeschool conference before, and I am so glad I got to go this year. The attendance was excellent, the conference ran smoothly, and the organizers treated the speakers incredibly well. My publisher’s booth was right across from Heidi St. John’s booth, and for the first time in quite a while, I got to spend some time talking with her and her husband, who has the world’s best first name (Jay). They are both wonderful servants of God, and spending time with them is a real blessing. I gave six talks at the conference: Homeschooling: The Solution to our Education Problem, ‘Teaching’ Science at Home, Building a Biblical Worldview, Ecohysteria, Creation Versus Evolution, and What I Learned by Homeschooling. They were very well attended, and I got some excellent questions afterwards. I also spent a lot of time taking with individuals, including several very impressive homeschooled students. One particularly impressive student was a junior in high school. After one of my talks, she asked me to sign a couple of her books. I noticed that one of them was my advanced chemistry course, which is essentially AP-level chemistry. I told her that I was impressed she was taking advanced chemistry, and she told me that she had already taken my biology, chemistry, and physics courses as well as a Human Anatomy and Physiology course. Once she finished advanced chemistry, she planned to take advanced physics. This means that by the time she graduates, she will have covered the equivalent of three AP-level science courses in high school! I told her how impressive that is, since many high school students don’t even take one AP-level science course. She was quite humble, however, brushing aside my praise and simply telling me that she really enjoys studying science. Another student and his family spoke to me about their experience with the third edition of Exploring Creation with Chemistry. As you might know, I don’t recommend that edition to anyone because of its many scientific errors and its habit of requiring students to know things they have not yet been taught. The student told me that he had started with the third edition of the the course, not knowing that I wasn’t the author. As he tried to cover the material, he got more and more confused. Eventually, he realized that my name wasn’t on the book, so he got online and found a used second edition of the course (which was authored by me). When he used that edition, he understood and enjoyed the material. I told him I was very sorry that he had to do that and, unfortunately, there are probably many students who have found themselves in a similar position. I got several great questions after my talks. After one of them (I can’t remember which), someone asked what it was like teaching on a university campus as a young-earth creationist. I told the person that I taught at two secular universities (Indiana University and Ball State University), and neither one of them were committed to academic freedom. As a result, I got a lot pushback for talking about the design that is obvious in both chemistry and physics. In addition, I personally think I was denied the opportunity to get tenure because of my creationist views, although that’s nearly impossible to prove. Since then, I taught a chemistry class at Anderson University (a Christian university), which is very committed to academic freedom. I received no pushback there, even though the science faculty members hold a variety of views on origins. During that answer, I also made the comment that there are very few Christian universities for which I would teach, because most of them require that you sign a statement that contains a long list of things the university requires you to believe. I said that I think such lists go against the fundamental mission of a university, which is to seek the truth. If you sign on to a long lists of beliefs, it seems to me that you are not really going to be seeking the truth, because there is a long list of things you are unwilling to question. Thankfully, Anderson University doesn’t have one of those lists, so I am happy to teach there. That comment led to another question from a homeschooling parent, which he asked me while I was at my publisher’s booth. He said that he wanted to send his daughter to a Christian university that did have a long list of beliefs to which the faculty must agree, and he was surprised that I was against such lists. After all, he said, he wanted his daughter to have professors who would encourage the beliefs he was trying to instill in her, and he was afraid that if he sent her to a Christian school without such a requirement (or worse yet, a secular school), her professors would shake her faith to the point where she might abandon it. I told this concerned father three things. First, research indicates that college is not a place where students abandon their faith. In fact, students who go to college are more likely to retain their faith than those who do not. In addition, those who go to college are more likely to say that it strengthened their faith rather than weakened it. The vast majority of the students in these studies attended secular colleges, so a college’s requirements when it comes to its faculty’s religious beliefs must not play a huge role in a student’s attitudes towards his or her faith. Second, while it is very tempting for us to make our children into little clones of ourselves, that’s just not our job as parents. Our job is to raise our children so they can follow the Lord’s calling on their own life. I didn’t want my daughter to grow up to be a truck driver, for example. I wanted her to be a writer. However, I am glad that she is a truck driver, because I can see that for right now, it is exactly what she should be doing. The same goes for our children’s religious faith. I tried to instill my beliefs in my daughter, but as she matured, she became a person in her own right, and she had to develop her own beliefs. While she and I disagree on a lot of things, I can see that God is moving in her life. She is not just parroting what I taught her. Instead, her faith is real enough that she has made it her own, and it is different from mine. That’s a beautiful thing, and we have to let that happen, or we are not allowing God to work. Third, a college student’s friends will influence him or her significantly more than any set of professors, especially when it come to the student’s deeply-held beliefs. Thus, if you want to make sure your child develops spiritually in college, you need to encourage him or her to have a lot of Christian friends. I strongly recommend that every college student becomes an active member of an on-campus Christian fellowship group. That way, the student will have access to other Christians who are trying to find God’s calling in their lives. The student will also have access to upperclassmen who have already experienced “the atheist professor” and can help the student deal with such challenges. Of course, all of this is predicated on the idea that the student in question is ready to start dealing with his or her faith in an adult way. That won’t be true of all 18-year-olds. As a result, not all high school graduates should immediately go to college or into the real world. Part of our job as parents is to know our children well enough to know when it is time for them to begin the process of becoming an adult. They should not leave our care until they have reached that stage of their lives. Thanks for the encouragement. We went through a hard time with a certain Christian college. Our daughter just graduated from there with honors in science and is studying for med. school now. We sent her there thinking she would continue in the worldview she was raised with. She loved her science professors, and one in particular, and also a Bible professor, taught her that theistic evolution is the most likely scenario for the beginning of mankind. These two teachers were also involved with (and still are) a well-known theistic evolution homeschool science curriculum. They believe that the science curriculums available for homeschoolers (we use only your curriculum, and they include that) do not teach the possibility of theistic evolution as a viable possibility. So they are designing a curriculum which will enable homeschoolers to learn much more about that position. Our daughter was influenced greatly by these professors and I am grieved that she prefers their position over the truth of God’s Word. She is a very strong Christian but still, I feel failure somehow as a homeschool mom. Anyway, it was interesting to read your perspective. Thank you for your comments about college and faith. My oldest just graduated college and I desperately wanted her to hold fast to MY faith. God has been very gracious in my foolishness and has led me to see that it has always been His place to lead my daughter in her faith.” One plants another waters but it is God who brings the increase.” So we disagree on many points, which leads to some interesting and lively discussions at times, but I see God actively working in her life and mine. For that I am extremely grateful. Hopefully lesson learned for this momma. Thank you for the thoughtful and well written post. As the mom of adult children who were homeschooled, I completely agree with your statement, “Our job is to raise our children so they can follow the Lord’s calling on their own life.” sometimes, giving up our plans and dreams presents the greatest challenge. Thankfully He is still in control. Blessings to you, Dr. Jay and thank you. Here’s a comment from a Catholic perspective. I was discussing with someone the activities of a certain priest who is for women priests, which is a non-starter in the Catholic Church. I asked the person I was talking with if the priest ever explained the reason why the Church does not allow women to be priests, and they said that he didn’t. My issue with priests like this is not so much that they personally oppose Church doctrine, but that the job of a priest is to clearly make known what the Church teaches, and if they aren’t doing that, they are betraying their mission. In the same way, I think a good compromise would be for a college to require professors to sign a document stating that they will clearly teach the doctrine of the religious body that constituted the college, while not requiring them to hold a belief in those doctrines. I think that could lead to some very interesting classroom discussions. That’s an excellent suggestion, SJ. This post has lots of food for thought, Dr Jay. Regarding ‘Exploring Creation with Chemistry’, a home edding friend asked today what she should do, as she was having difficulty obtaining a copy. Thanks to the updates on your blog, I was able to give a brief outline of the situation re the 2nd v 3rd editions, and that she would probably have trouble getting a copy of the 2nd ed. I recommended that she go to the Berean Builders site to download the sample copies of your new Chemistry book. I suggested that your new book had given you an opportunity to: a) update experiments to ensure that chemicals were easy to obtain, b)rearrange the order of topics to make the course more effective, and c) add some interesting new insights. I told her that the difficulties with the new revised Apologia Chemistry book had perhaps, therefore, done some good. I also told her that the ETA for the new book is autumn of this year. Did I tell her the right things? You did, indeed, Anthea. Thank you. PS The 2nd edition of your Chemistry book is priced on Amazon for 88.28 — that’s pounds, not dollars! For a secondhand copy. The 1st edition is 25.97 pounds. I hope you finish your new book soon, or my friend shall have to sell a kidney to buy a textbook! Two of our three children graduated from Cedarville University, in 2000 and in 2010, and the third from Grove City College in 2009. Cedarville has a list of lifestyle commitments students must adhere to and a list of doctrinal positions that the professors must to adhere to. Cedarville is unapologetically young earth. We had been taught old-earth creationism, so this was a new point of view for our kids. But in spite of their rules, Cedarville strengthened both of our kids’ faith and gave them world-class educations. Cedarville also sparked an interest in ministry/missions in them. Our daughter majored in physics and then went into full-time Christian service for four years after college and then got a PhD in physics from Cambridge University. She is now a post-doc in physics at Sydney University in Australia. Cedarville prepared her very well for academic success. Same with our son. Our son went into the Air Force for five years and now develops network security software for a private company. The son at Grove City went into the Marines for 5 years, and now works at Ernst and Young in NYC in finance. My husband and I highly recommend both of those colleges for Christian young people. We even endow a scholarship for homeschoolers at Cedarville. All of our kids love the Lord, have married godly spouse who they met at school and have children. Even if you chafe under rules about dress or behavior, it is always good to learn to have a spirit which is submissive to authority. Jay, I have a recommendation for your NEW CHEMISTRY edition. Since every child is different, it would be so helpful if you would cover the very basics and some review questions in the chapter for students not going into science first, and then cover material/math/concepts/additional review questions for those who plan to go into science at the second part of each lesson. This way, the text could cover a basic high school credit, even for those who struggle in science, and could also be used for those students needing good preparation to go on and study all the material. I think this appeal to make things more basic and understandable may be where the competition has targeted. If a wide variety of students can use the books, they will compete well in the marketplace. Get non-science people to review the basic section to make sure its really understandable to those with no science background. Thanks for the suggestion, Marie. Unfortunately, I am not sure how that could be done. A basic chemistry course takes a completely different approach from a rigorous one, and I am not sure how you could do both in one text. I really enjoyed your workshops that we were able to attend this past weekend. We’d already bought and looked through Science in the Beginning before the convention since we use My Father’s World and that is what they recommended for our upcoming year, but now I’m even more excited to dive in to it! Thanks! Hey Dr. Wile, I appreciate your solid, accessible science educational writings a lot. I studied your biology and chemistry book back in my home educated high school days. I read a paper that you linked to in a previous post that discusses basic phylogeny and puts it forth as a foundational concept in evolution. I’ve been trying to wrap my head around this and answer the question I keep asking myself: why does evolution make so much sense for so many people? (Other than just dismissing their point of view as lacking openness to evidence, which may be true, but doesn’t help me understand why it makes sense to them) Regarding phylogenies and taxonomy, it seems to me that there is a crucial assumption made, something like, because these organisms share physiological traits, and based on (inspired by?) what we know of genetic descent, they must have given rise to these other organisms.” Am I on the right track? Do evolutionists build what seems to them a reasonable theory but with a foundation on a big assumption? I think you are basically right, TF. Evolutionists see a lot of shared similarities among organisms, and they say the most reasonable explanation for these similarities is inheritance. Creatures that share a lot of similarities are closely-related, just like people who share a lot of similarities are usually part of the same family. On face value, this makes a lot of sense. Of course, when you dig into the details, there are far too many contradictions to make it a useful theory. The 2015 California Homeschool Conference: Wisdom from Jacob and Kristine Barnett What is the Relationship between Christianity and Science? Ask These Two Scientists.